Meghan Markle has revealed she is six months pregnant and due to give birth to the royal couple's first child in April. 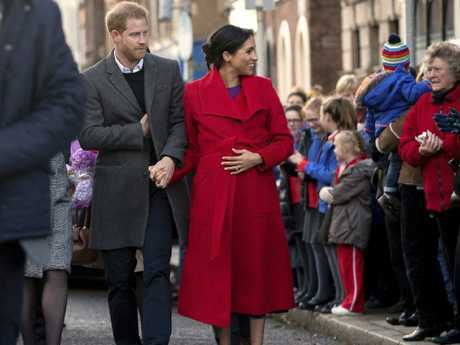 The Duchess of Sussex thrilled crowds in the English town of Birkenhead overnight, cradling her growing baby bump as she joined husband Prince Harry on their first official outing for 2019. 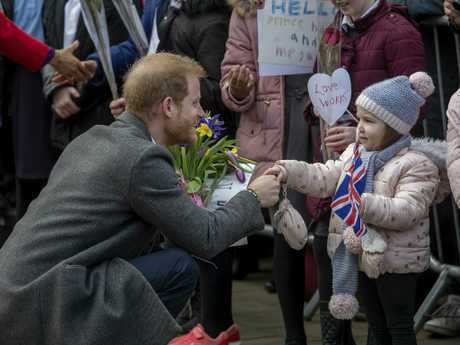 The popular Duke and Duchess are in town for a series of engagements and were met by large number of wellwishers who clapped and cheered as they got a glimpse of the pair. 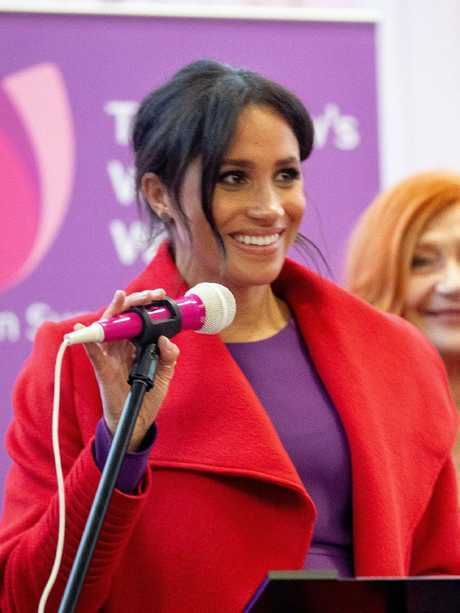 Ms Markle, 37, wore a striking purple dress from Canadian fashion label Aritzia and a vivid red coat by Sentaler. She held a Gabriela Heart bag and still managed a pair of towering red Stuart Weitzman stilettos despite being heavily pregnant. Prince Harry, 34, put his arm around his wife as they were introduced to the welcoming party. The former Suits star was overheard sharing her due date with a member of the public - something that has not been known until now. "We asked her how her pregnancy was going and she said she was six months and she tapped her tummy," a royal fan named Carla Gand, who was there with her four-year-old daughter Sofia, told People. 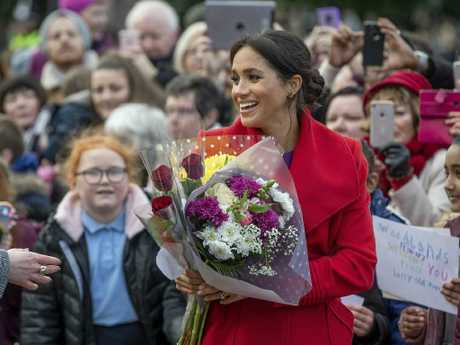 The Duchess told other wellwishers gathered in the town's Hamilton Square that she is due in late April or the start of May, according to royal correspondent for Hello, Emily Nash. She also revealed they didn't know if the baby was a boy or girl because they wanted it to be a surprise. When Kensington Palace announced the royal baby news last year - as the newlyweds began their royal tour to Australia and New Zealand - the only detail given was that it would be born in the northern Spring. If the royal baby is born in April it could share a birthday with Prince Louis, who was born on April 23, or even possibly the Queen who was born on April 21. The couple has only been seen in public a handful of times since their triumphant Pacific tour, and since a wave of negative publicity began about the former actor. They were last seen in public on Christmas Day at Sandringham with other members of the royal family, including Prince William and Kate Middleton, who they are said to be feuding with. 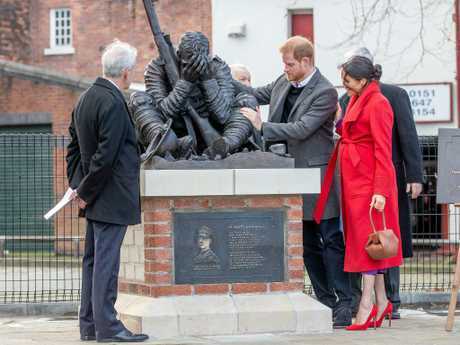 During Monday's outing, the Duke and Duchess of Sussex paid their respects to acclaimed First World War poet Wilfred Owen by viewing a sculpture in Hamilton Square marking the 100th anniversary of his death. Excited fans shouted "Meghan" as the royal pair unveiled a plaque, before they met local veterans and members of the Birkenhead Institute Old Boys, which Owen belonged to. Harry gave a four-year-old girl in the crowd a hug after seeing her sign that said "Gingers Unite - I love you Harry". "I love this, do you love your hair, this sign is amazing," he told the little girl. During Monday's outing, the couple visited a number of community organisations including Tomorrow's Women Wirral, a group that supports women in vulnerable circumstances. Meghan has been a vocal supporter of women's rights for several years, from the time she first shot to stardom as a television actor. They also took a tour of a Feeding Birkenhead citizens supermarket and community cafe in the town while officially opening Number 7. Feeding Birkenhead is a coalition of churches, food banks, community groups, and other organisations working together to eliminate hunger in Birkenhead. The supermarket enables local families to buy their weekly shopping at a discounted price, and provides advice and advocacy on benefits, looking for work, debt, budgeting, and cooking. Last week it was announced Meghan would become patron of Smart Works, which helps long-term unemployed and vulnerable women get back into employment, helping with interview coaching and mentoring, and providing work-ready clothing for them. The animal lover will also become patron of Mayhew, a historic charity which teaches animal welfare and responsible pet ownership for young people, works to keep homeless people and their dogs together, and runs a pet refuge to care for pets when their owners are in crisis. On Wednesday, the soon-to-be parents will visit an animal charity and take in a presentation of Cirque du Soleil's Totem. Meghan also inherited patronages of the National Theatre and the Association of Commonwealth Universities from the Queen. "The Duchess is delighted to become Patron of both national and grassroots organisations that are part of the fabric of the UK, and is very much looking forward to working with them to bring wider public attention to their causes,'' Kensington Palace said in a statement. "Her Royal Highness feels she can use her position to focus attention on, and make a particular difference to these organisations and, more widely, the sectors they each represent. 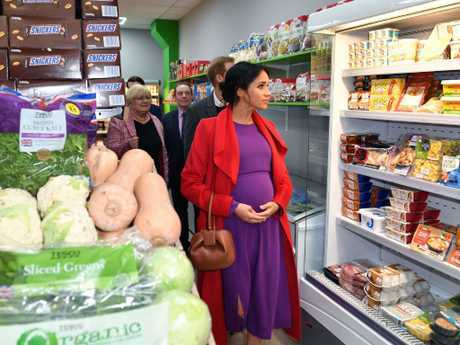 Meghan has indicated she intends to work until late in her pregnancy.